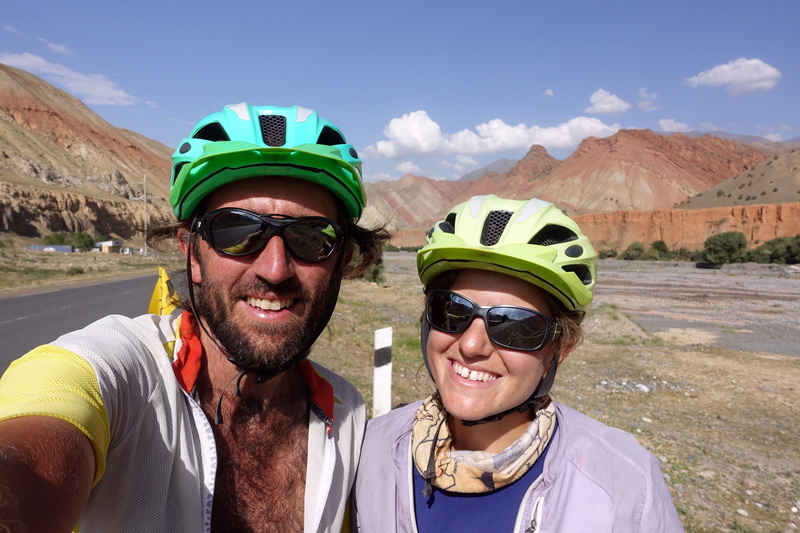 After our 100 km hustle from Jalal-Abad to Osh on heavily trafficked roads, Cédric and I were happy to settle down for a few days and plan the next leg of our journey. 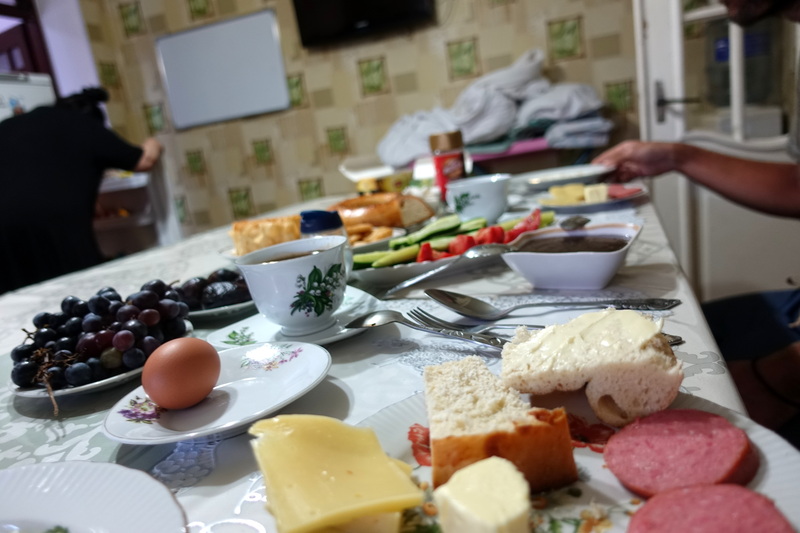 Recovering from our pizza overload (see the picture in the previous post) and an epic breakfast prepared by our homestay, we rode off to the sprawling Osh bazaar in the late morning. 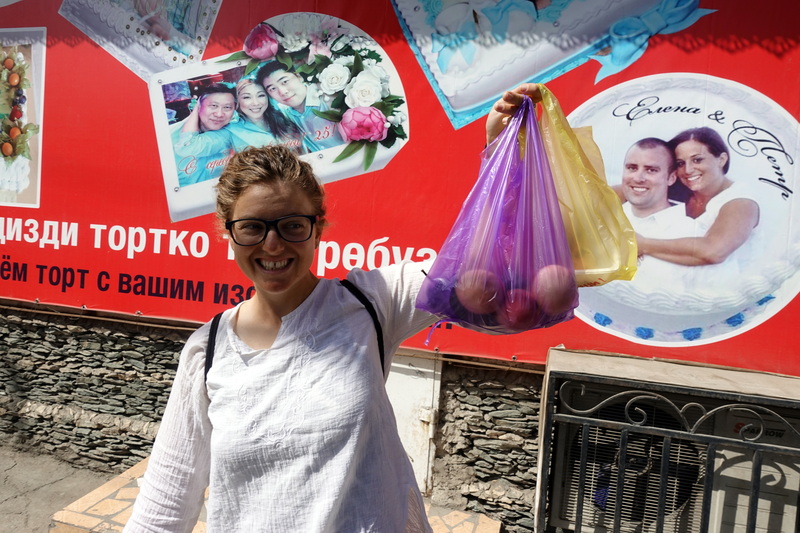 This bazaar is Central Asia’s largest outdoor shopping area and has a total length of nearly one kilometer. 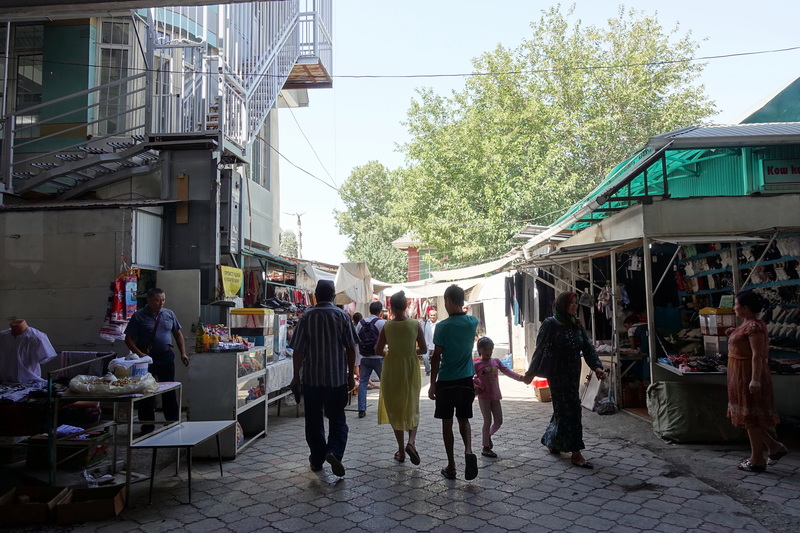 Unlike the romanticized Turkish bazaars, with stalls overflowing with spices and handmade goods, the bazaar in Osh is a byzantine, shipping container-filled place. 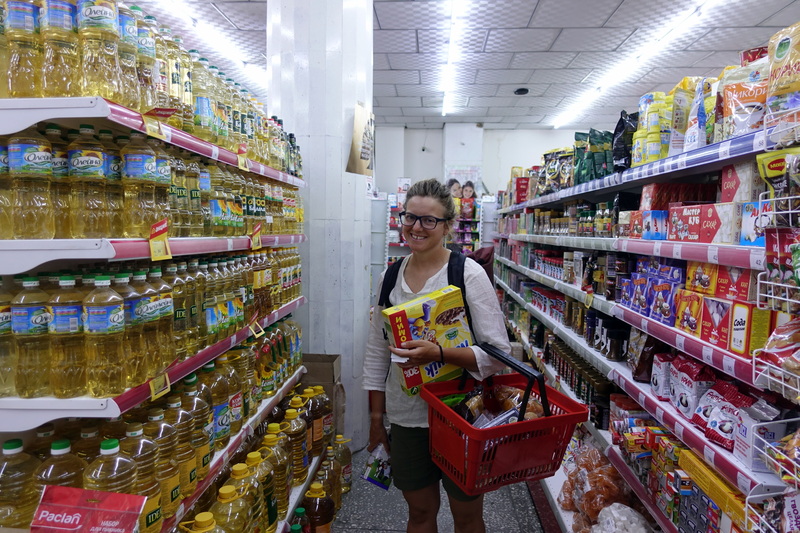 If it’s not too elaborate and high quality (most things here are cheap Chinese products), the piece you’re looking for can surely be found, but it requires an hour of wandering around and peering into every stall. After asking around at the first bike stalls we saw for ‘Hajiakbar,’ a much-trusted bike mechanic, we received gestures indicating that he’s way down the bazaar. 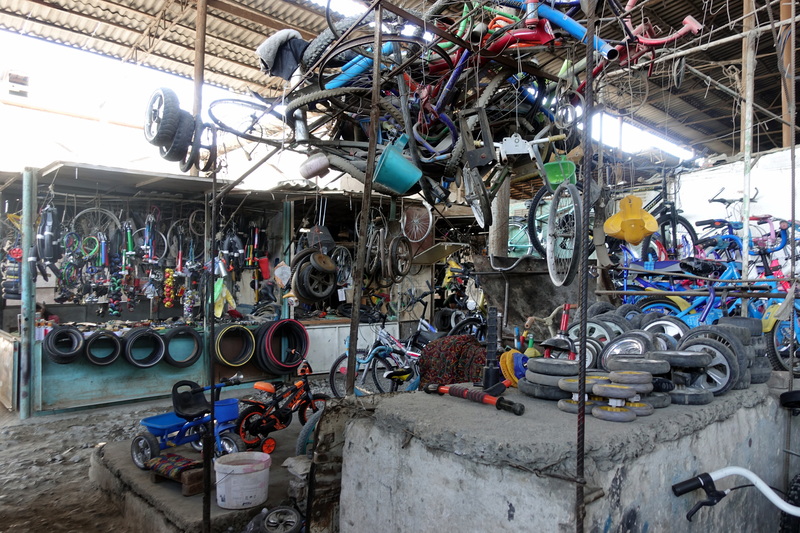 An observer noticed our predicament and offered to take us through the labyrinth of stalls to where the bike mechanics were located. While we were marching and weaving down the halls of the bazaar, we wondered if this individual was simply helping lost tourists or, like in Marrakesh, profited from the maze-like streets and alleys of the bazaar and would expect a handsome tip for ‘helping us out.’ (In the end, it was the former). 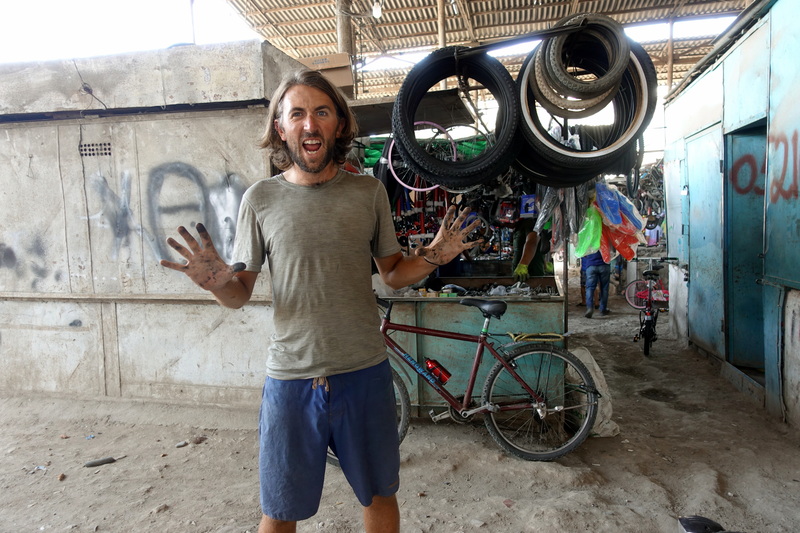 Once we arrived at the part of the bazaar with all the mechanics, Cédric looked for Hajiakbar while I inadvertently welcomed everyone around to touch and prod the Hase Pino. Once we found our mechanic, we were able to pull the axle screw out with a few welding and disc saw maneuvers and replace it with another. 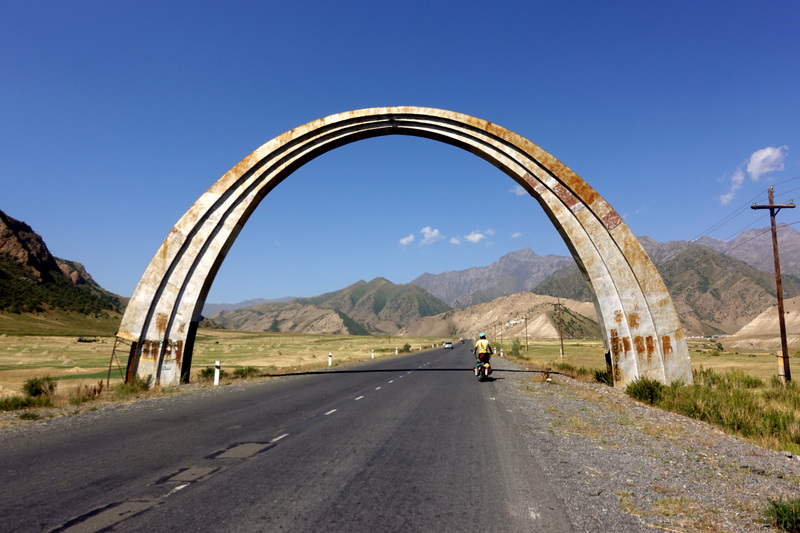 The fix wasn’t ideal, but it should hold until we get another part in Dushanbe. If you need any part, you can probably find it… although it won’t come in shiny new packaging! It may also be second-hand (or fifth-hand! ), probably a chinese knock-off and if you have any special part – well, be inventive! As we were packing up to leave, we noticed that a piece of our trailer flag was missing. Although the merchants were trying to tell us that we had no flag when coming, we were sure about the opposite (simply because we had a part of the flag remaining). We looked around for a couple of minutes just in case we would have put it inadvertently somewhere, but nothing. A little pissed off that someone would have taken such a useless and ridiculous part (a glass-fiber stick holding a yellow flag), yet fairly useful (we try to believe that cars notice the flag when stopping behind us instead of running into us). We walk away in a bad mood, when Cédric sees a kid holding a part that looks very much like ours, grab it from the kid and (try to) explain to the dad (and a policeman who was drinking a tea, probably as his main job task) that his son is a thief… unfortunately our Russian language skills are not fluent enough to explain him that “qui vole un oeuf vole un boeuf” (give him an inch and he’ll take a mile), and that they should consider doing something. We got a lame explanation that actually an older person took it and gave it to him as a gift, the policeman just enjoyed looking at the scene with his tea – we took the part and left, not thrilled and again not excited about the Fergana valley (Kyrgyzstan is composed of several ethnic groups in the different regions of the country, the Fergana valley is far away from the nomadic way of life in the mountainous parts of the country). 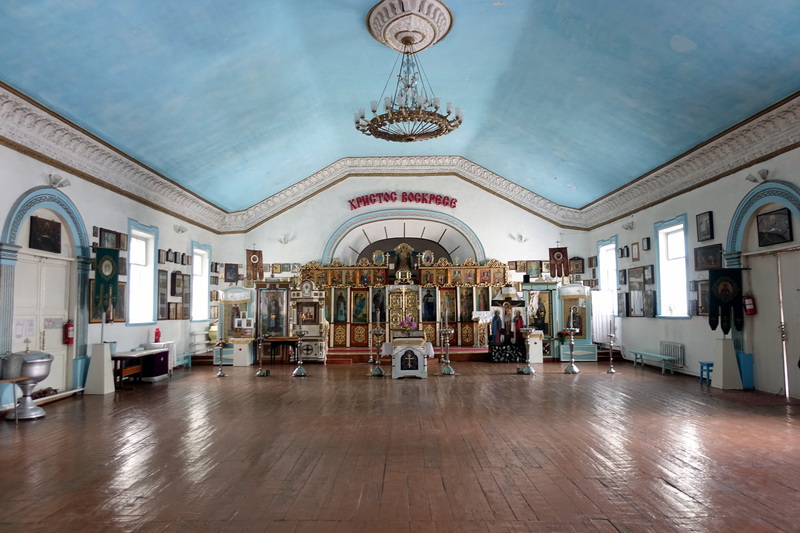 Exhausted from the day’s events, we ventured out once more to find a late lunch, an Orthodox church, and yet another Lenin statue. Later that night, we once again left our guesthouse for shawarma and roam around the streets. 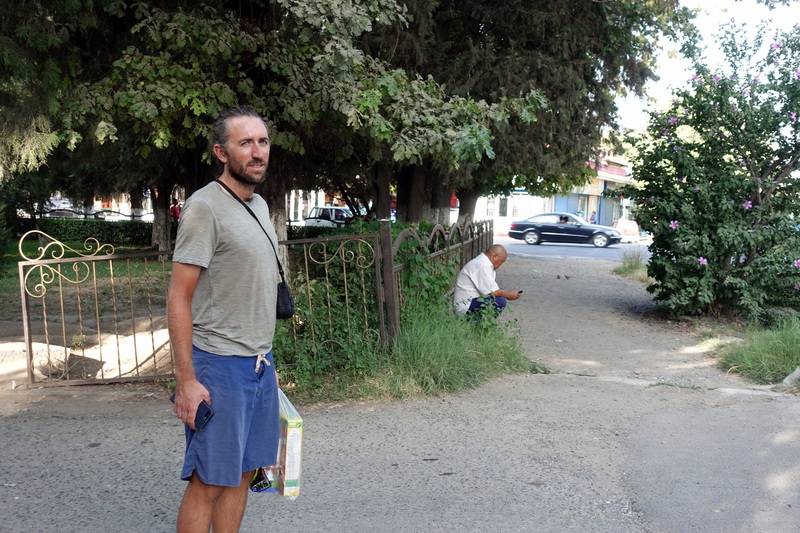 Cédric, looking like a knowledgeable tourist, was approached several times by other travelers looking for a place to stay or a map of a city. We also had a bizarre exchange with a couple who wittingly left their cellphones at home because who needs a phone anyway, explaining us that all hotels are booked-out, only to use our phone as a map and to find them a hotel for the night (where not a single place was sold-out, but apparently a couple of dollars were still too much – some tourists are seriously dumb). 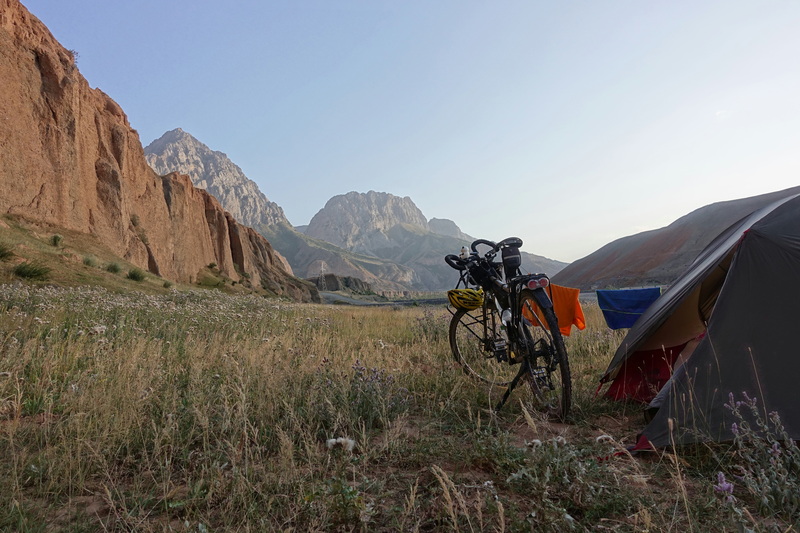 The next day, we rested and prepared for the onward journey towards Tajikistan, happy to leave the mess of the city and back to quiet camping spots. Another Lenin! This time well maintained and extra-large. 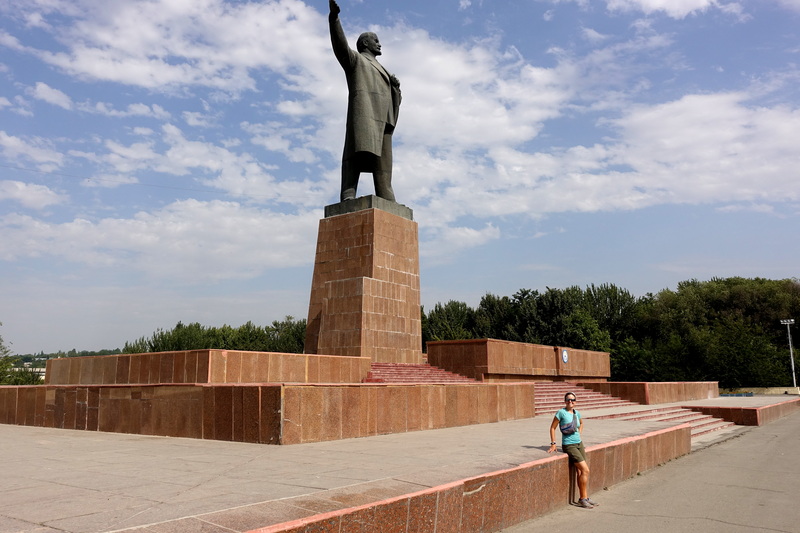 It’s more and more difficult to find those statues, the USSR has not always been the greatest for local culture. And visit a Western-style supermarket. Cedric couldn’t resist getting some Chocapics! 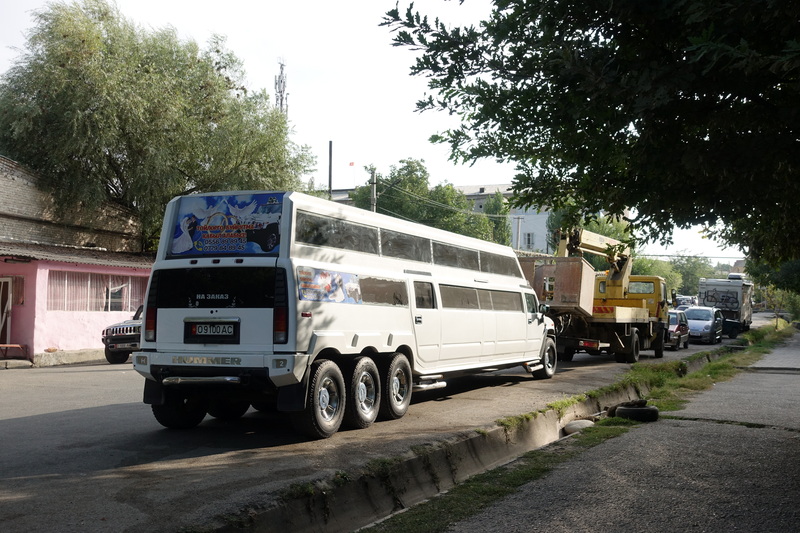 We found that the Kyrgyz tend to go all out for celebrations. It wasn’t long enough, so they also increased the height. 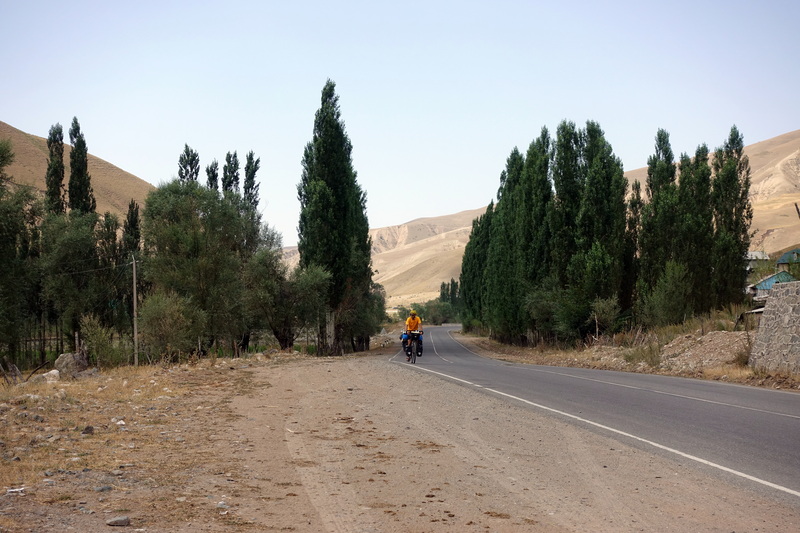 We left Osh the next morning and maneuvered the traffic as we cycled south. Just a few kilometers outside of the city, we were passed by a few mountain bikers with suspiciously clean and fancy mountain bikes, not a single scratch, then a few more, and at lunch, even more. 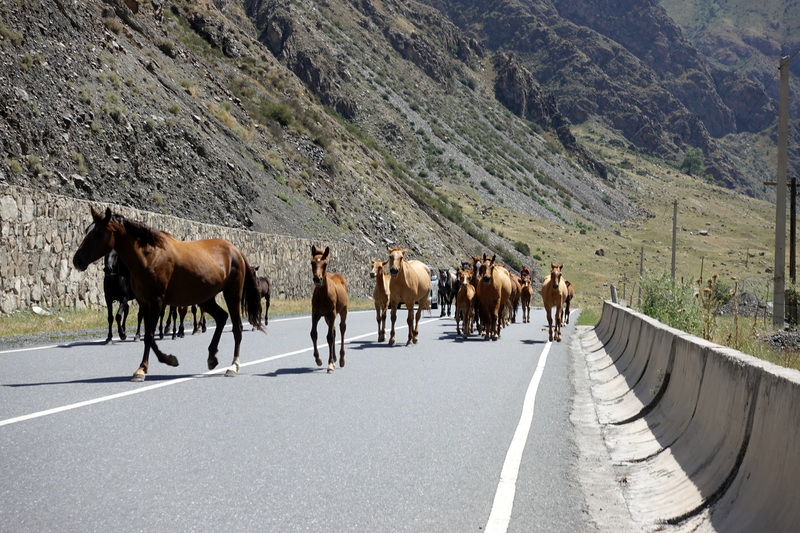 At one point, we spoke with one of them and found out that they were part of an organized tour that was chauffeuring their luggage from hotel to hotel as they made their way across the Pamir Highway. 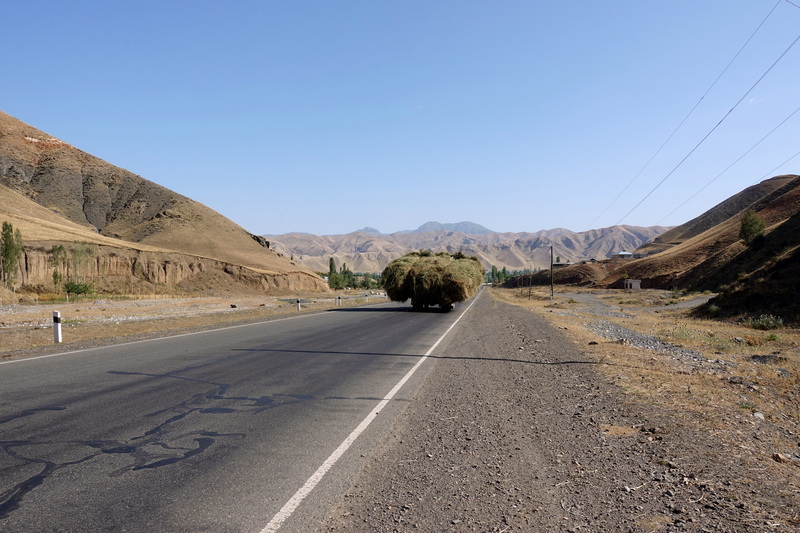 As usual, most of the people of that group did not say hello (while 100% of cyclo-tourist do), and one explained us that unlike our tour, their 10-days circuit was more adventurous! Sure! Well, the joke was that we had a similar pace for the next three days (no idea which road they took afterwards, but we suspect some bus-ride cheating), although the iron horse is about 70kg heavier, without a mechanic, someone to prepare meals and accommodation, and the backup backseat of a SUV. For Cédric and me, this type of luxury bike trip doesn’t test your true grit while on the road, and group-tours are definitely never going to be an option anytime soon (we will have another similar encounter with an uninteresting, shinny but unfit and rude British group a few days later…next post!). 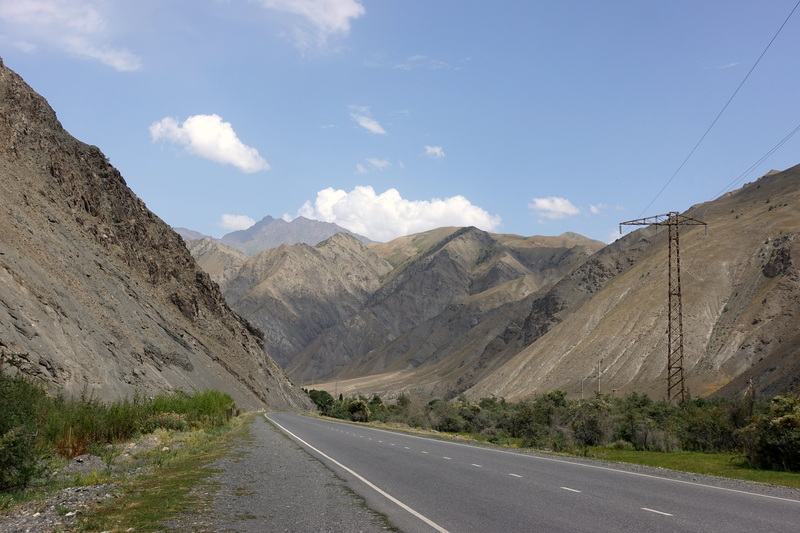 As we continued our day climbing up towards the Chirchik pass, we met two New Zealanders and an Italian guy who were also making their way towards the Pamirs. 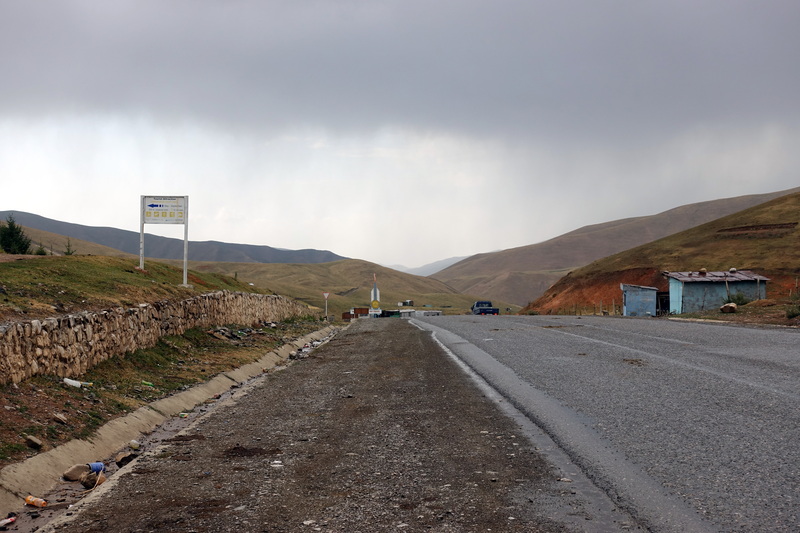 Just before we reached the pass, the storm clouds that had been swirling around the mountains the whole day broke and we sought shelter in a kumis stand on the side of the road. 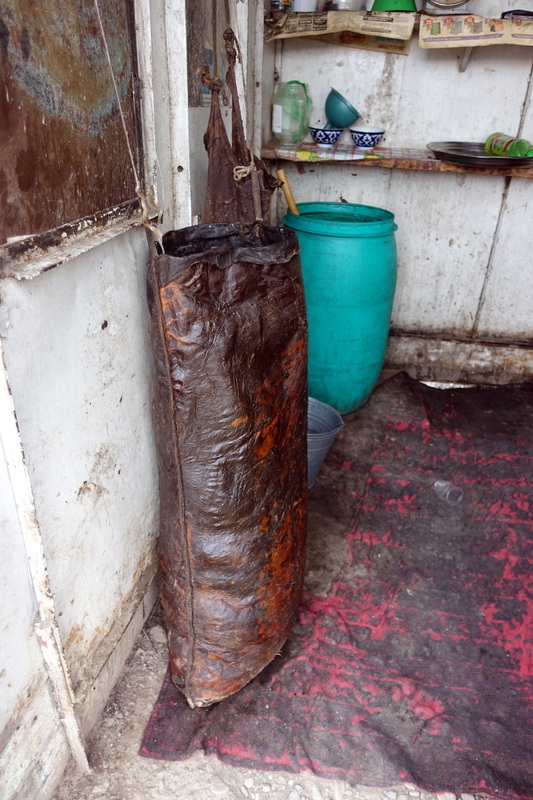 As I saw the smoked leather bag where kumis originates, I thought to myself, ‘Never again.’ The rain shower was quick, so Cédric and I hopped back on the bike and found a camping spot near a river just a few kilometers after the pass. We were met by the other cyclists and ended our night with a campfire while telling stories of our travels on the bike. A common sight while cycling through towns and villages. 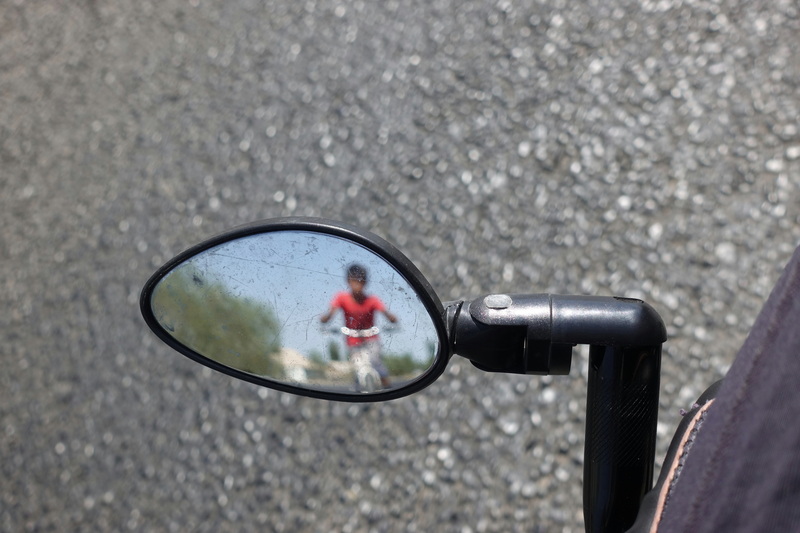 A kid with a bike sees you, forces to pass you and stops 50m afterwards – faster than the two foreigners: mission accomplished! Daniele, a fellow Italian cyclo-tourist not too far behind! And we always attract a crowd. This time three (!) buses of German students at the pass, one of their bus had destroyed a wheel, and we ended up been as fast as they were the next three days. 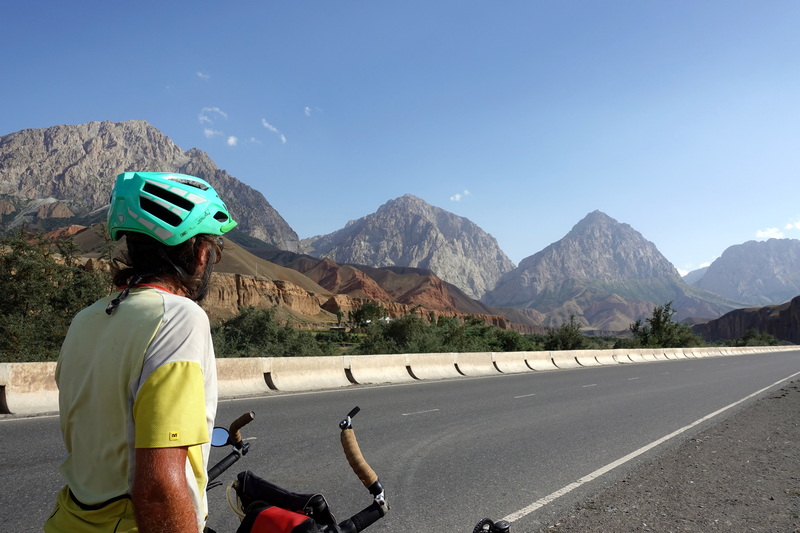 Keen to make good gains on our way to Sary Tash, we set off the next morning for the last downhill ride of our day. 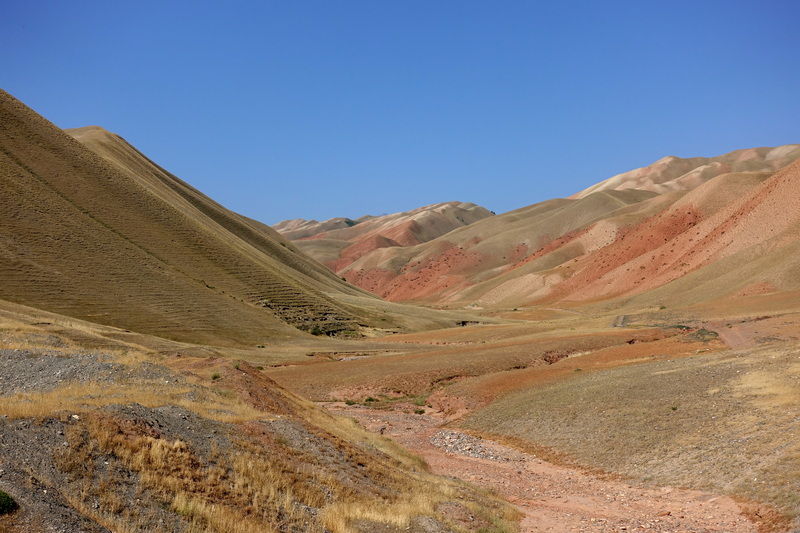 The further we cycled, the more varied the landscapes became – red canyons and glacier studded mountains way in the distance. 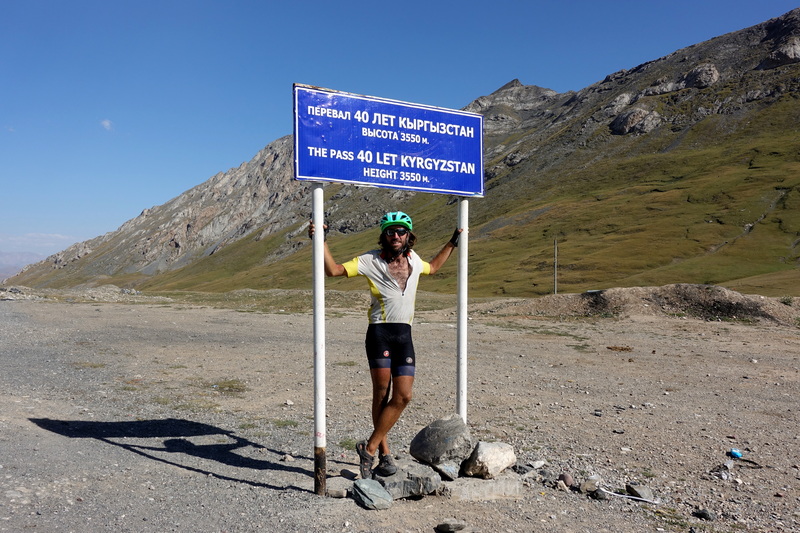 Along the way, we were greeted by cyclists who were coming off of their Pamir high and excited by the prospect of completing their journey and possibly a proper city with running water. 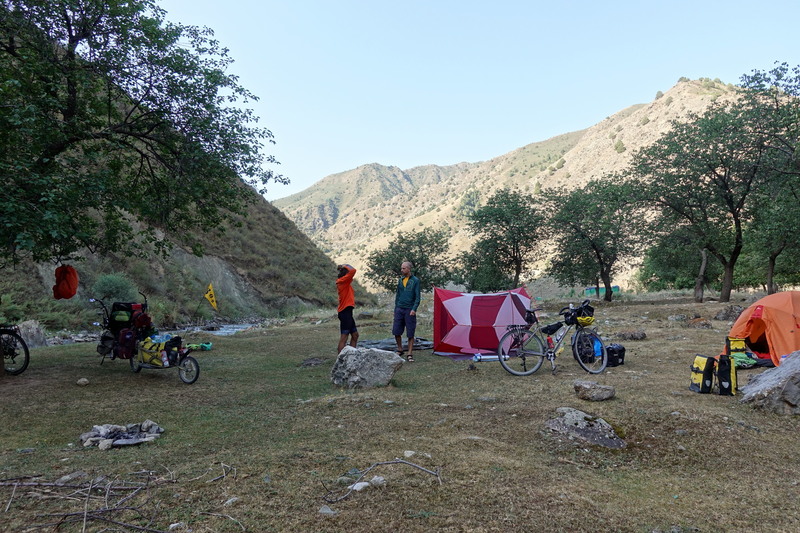 At lunch time, Daniele, the Italian cyclist, caught up with us and we continued cycling up the valley and through small villages. Here, children are used to cyclists and seemed to have a sixth-sense for when one was approaching- eager to run out to the street screaming ‘Hello!’ and sticking their hand our for high-fives. 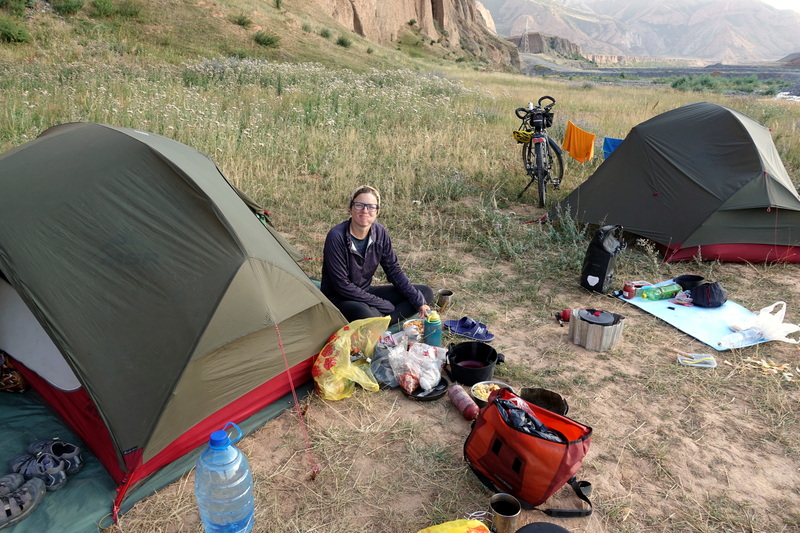 In the evening, we found the local watering hole near the village Kichi-Karakol with pure water coming from higher glaciers and decided to camp near the fresh water, despite the amount of people coming and going. 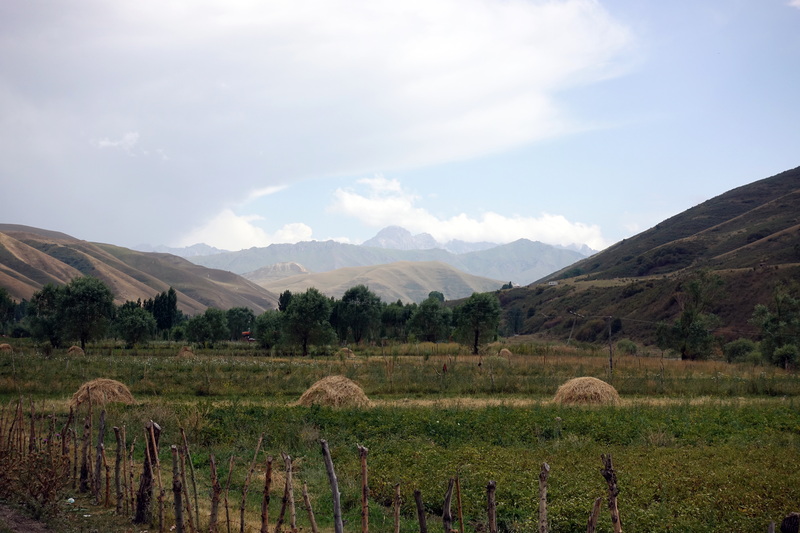 In our journey towards Sary Tash, it became increasingly apparent how many villages and towns in Kyrgyzstan don’t have basic indoor plumbing. 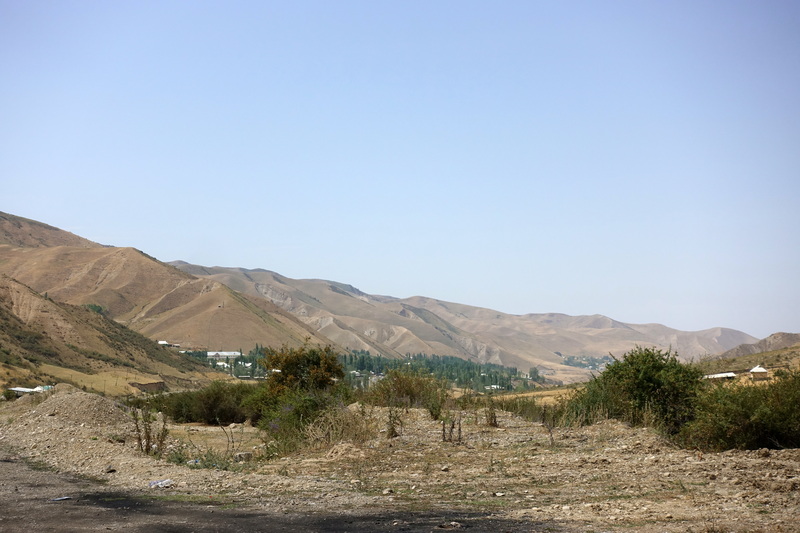 We (Cédric more than I) became used to outhouses, but along this valley we saw an increasing amount of people using wells and pumps for water which are located on the main road. 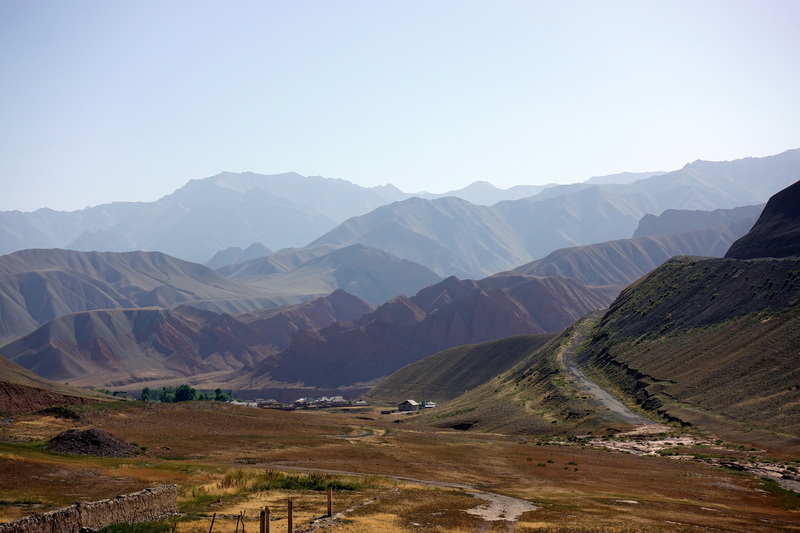 In some villages, such as Kichi-Karakol, the preferred water source was a nearby stream coming directly from the mountains (protip: don’t take water from the main stream). 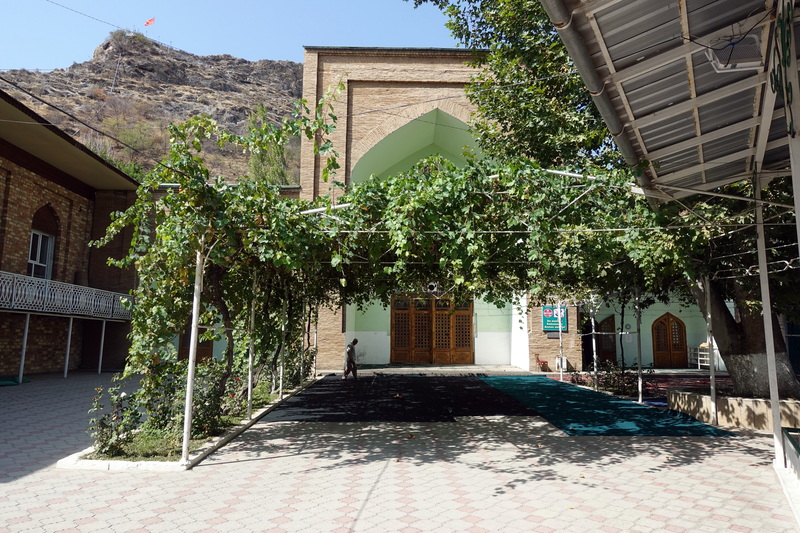 As we set up our tents, family trucks and cars passed to fill up large drums with fresh water. Daniele also entertained two teenagers by allowing them to ride his bicycle and took pictures of them with their smartphones proudly sitting atop his bike– and after a couple of minutes wondering if letting a 10-year-old ride his bike across the river was such a smart decision. Tearing down camp in the morning. 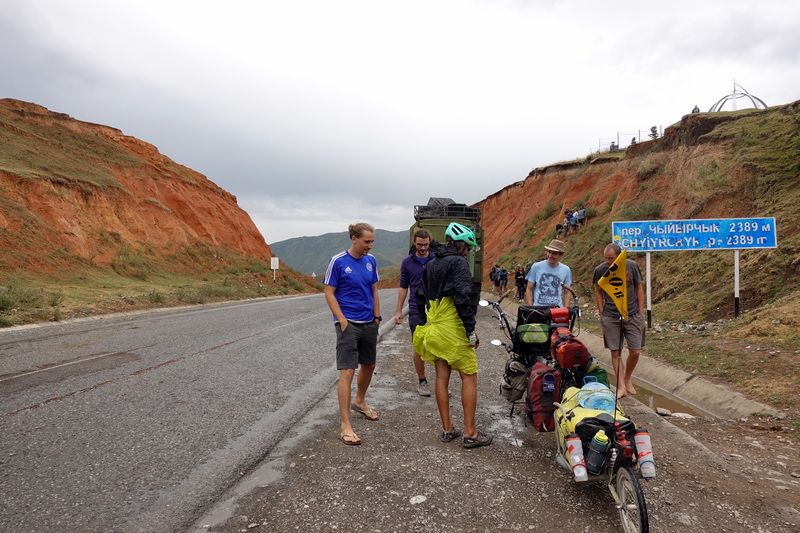 Central Asia is more remote than any of the previous places we had been too – except for the amount of cyclists: we have often met more people some days than in 10 weeks across Australia! 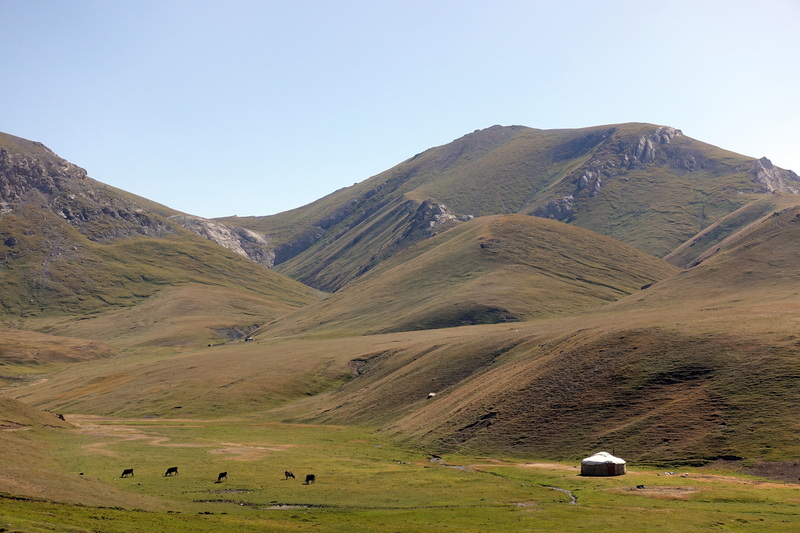 The next day, we continued our slow climb up towards the Taldyk (Thankful in English) pass. 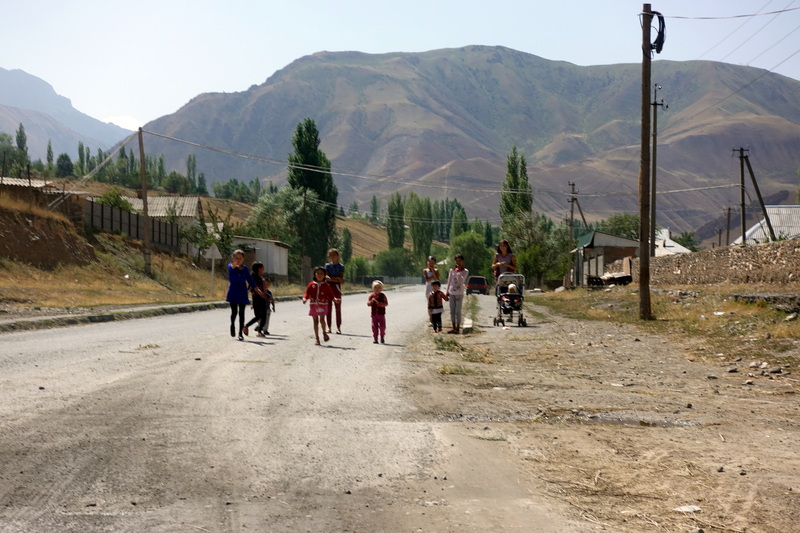 We crossed the last few villages, giving more high-fives to the children, and waving to the locals. 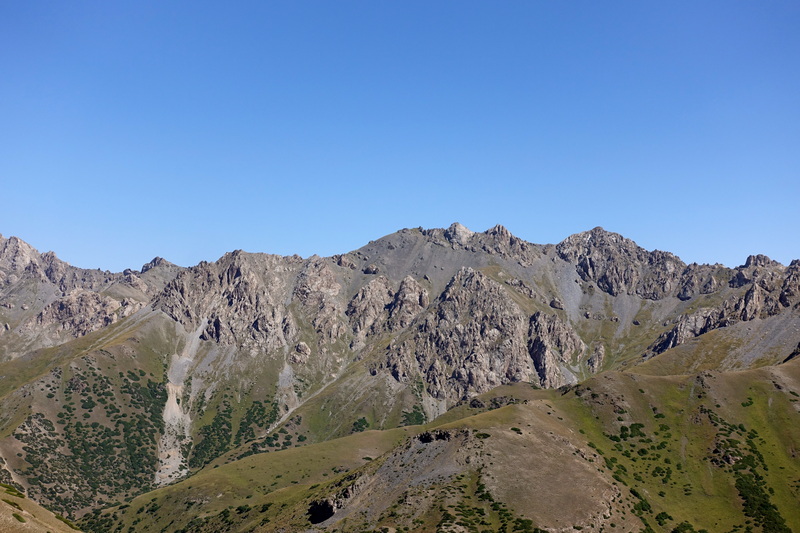 As the valley began to narrow it also became steeper and finally as we neared the end of the valley, we started the arduous switchback climb up 1200 meters. Each time Cédric and I stopped, we were panting because the air was thinning. 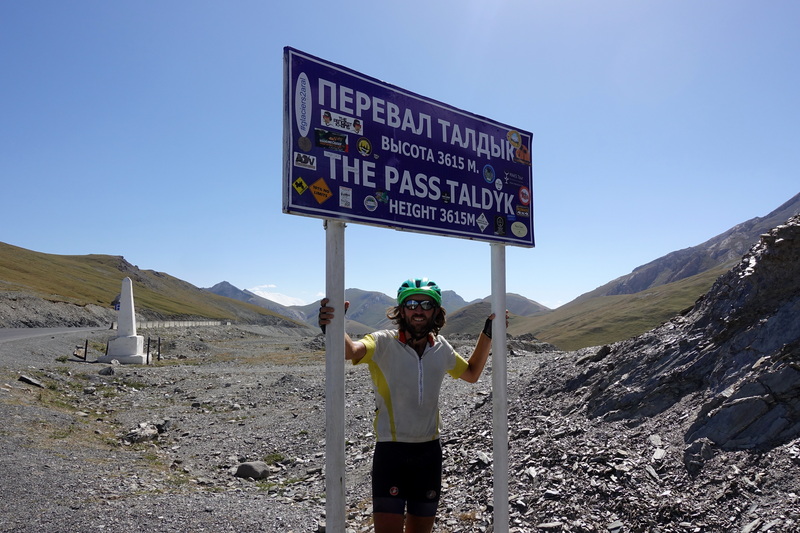 As we reached the top of the Taldyk pass at 3650 meters, we recorded a new altitude record for the Pino. 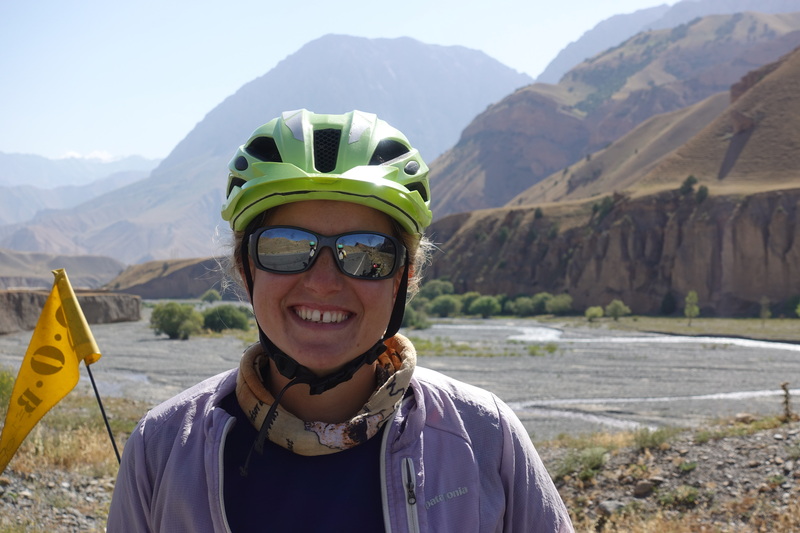 We took pictures with Daniele and then continued cycling to Sary Tash. 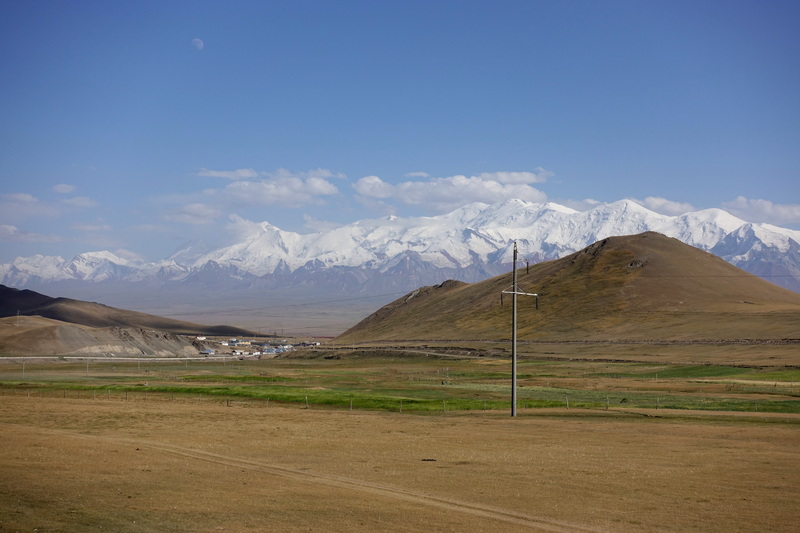 As we descended into the Alai Valley, we could see the glacier-covered peaks of the Pamir Mountains at over 7000 meters, with the Lenin Peak becoming more and more visible. 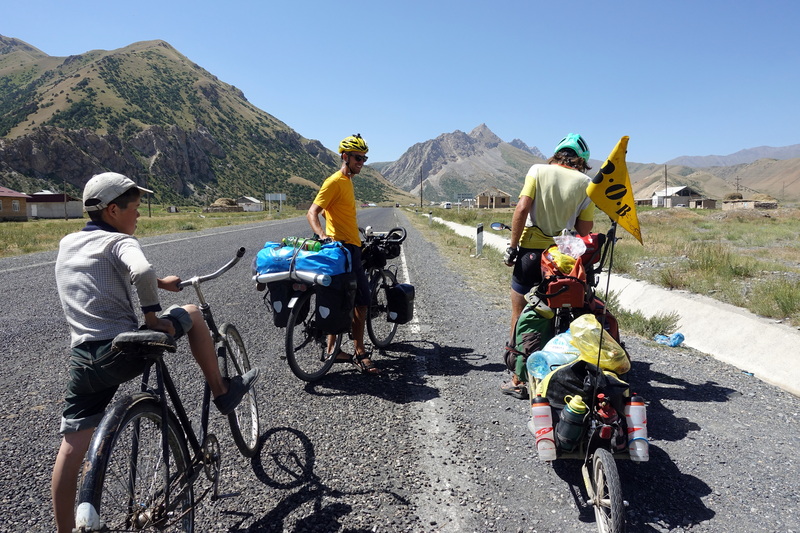 While buying supplies at a market in Sary Tash, Cédric met two tandem+trailer cyclists from France who invited us to stay at their guesthouse for the night. 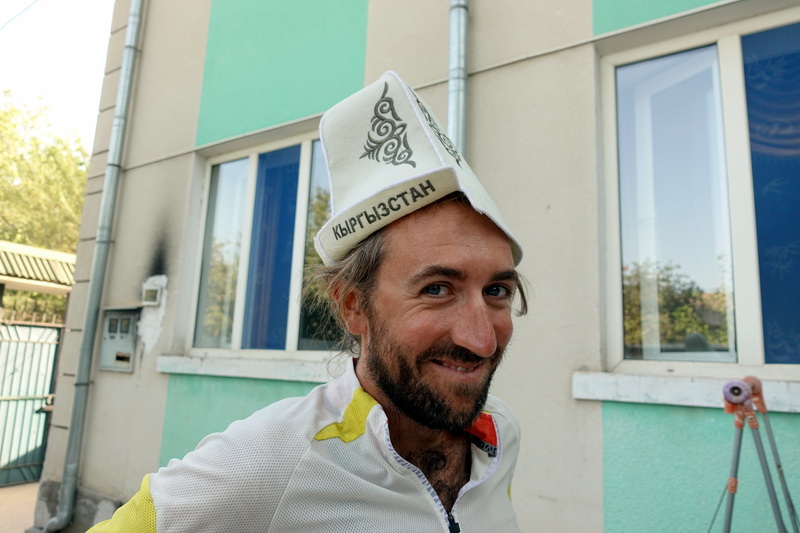 As we arrived, we were surprised to see even more cyclists and we were all excited to share stories of our journeys over tea and a heaping plate of potatoes. 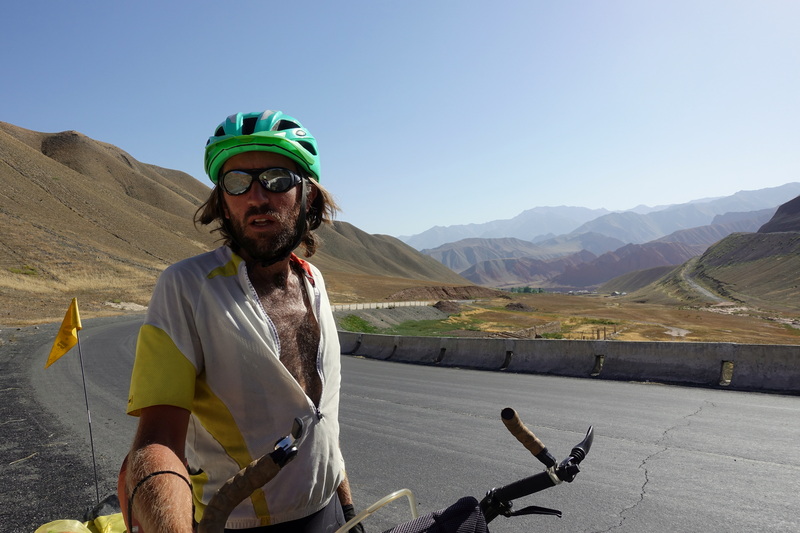 (From here on out, Cédric and I will be attempting to avoid meat due to lack of constant electricity – generators for a few hours at night – and clean water sources… we’ll let you know if we succeeded). 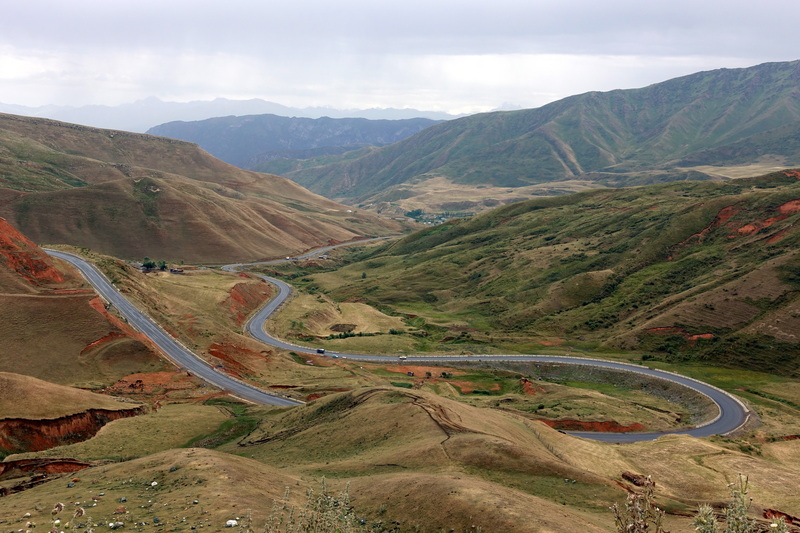 Osh to the Tadjik border is basically a long 200km+ continuous climb starting at an altitude of 900m up to 4300m. 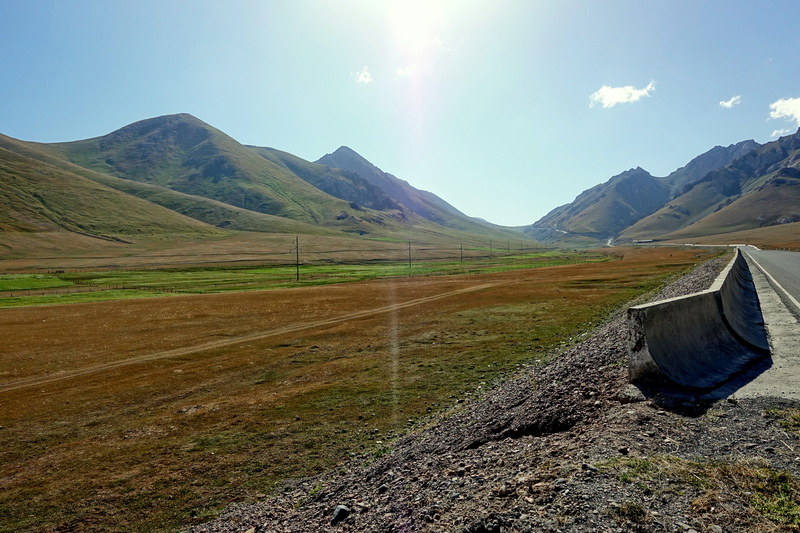 Karl Marx’s style in the foreground, peak Lenin in the background (the white mountain in the middle is not a cloud, but a 7000m summit!). 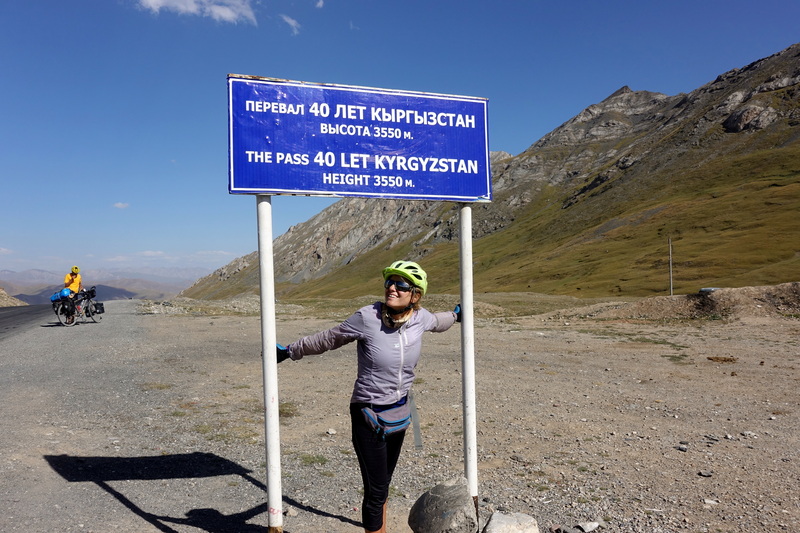 Yes, that’s a really weird name for a mountain pass… Cassie is trying to maintain the sign straight. A bit of downhill: over 70km/h clocked – unseen in months! 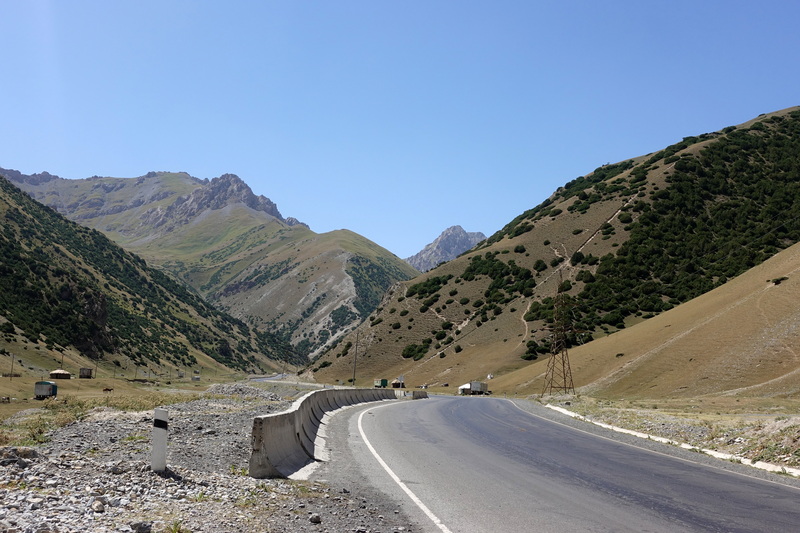 The descent into Sary Tash and a view of what’s to come… Kyrgyzstan is remarkable as every single village is connected to the electrical grid – however the poles are placed in the easiest part of the valleys and it’s been ruining a bit all the pictures. 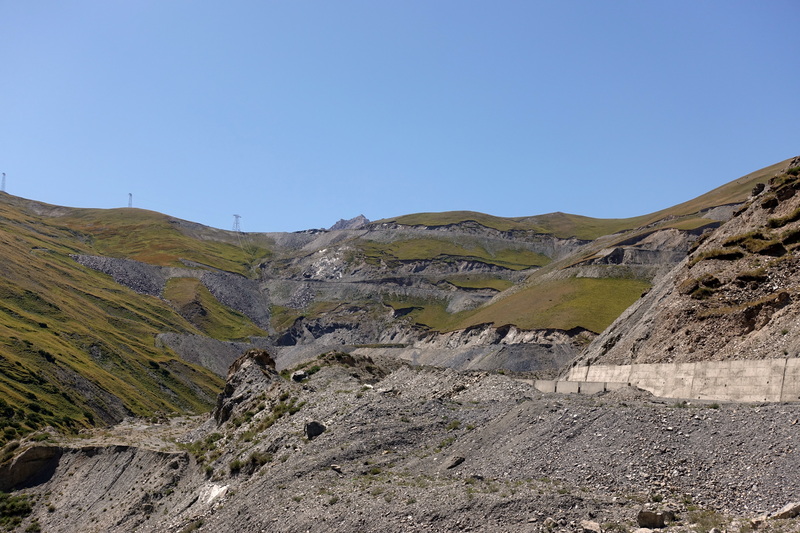 110000m so far…or how to take the hilliest roads all year long! Photoshop the poles out of some pics maybe? I continue to be in awe of the amazing pics you have recorded! Parts of the world that I will never be able to visit, but almost feel as if I’m there with both of you as I read and re-read some of your posts. 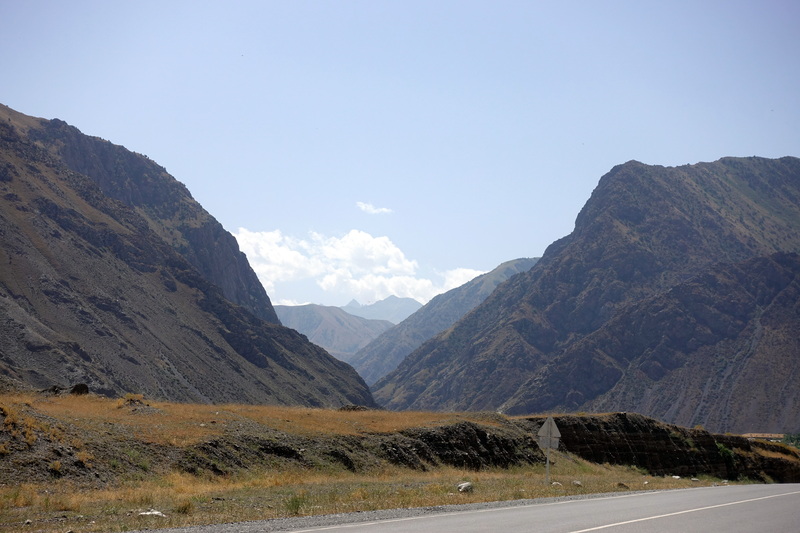 There’s no reason why you couldn’t come to Tajikistan! 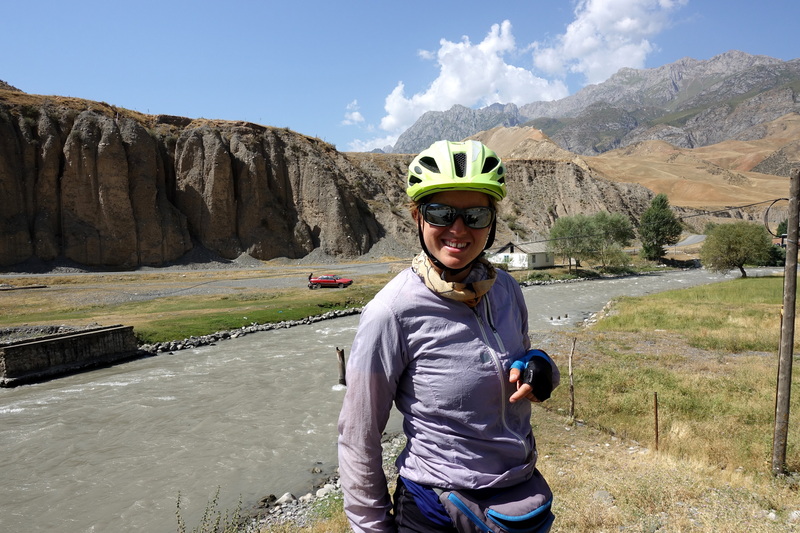 Most of tourists travel with drivers and SUVs, we are thinking of coming back in a few years in fast and ultralight cycling mode to go through the wakhan and bartang valleys.